As U Wish dresses are fun, flirty, stylish, and affordable by design. With short dresses, casual dresses, junior dresses, and party dresses in plus sizes, this assortment of designer dresses has a look for any woman, every event, and any budget. Shop this section to find chic and unique party dresses for under $100 that feature the season’s hottest fashion trends. As U Wish dresses offer vibrant floral prints, fashion-forward designs, and finely detailed accents to create ultra-feminine party dresses. 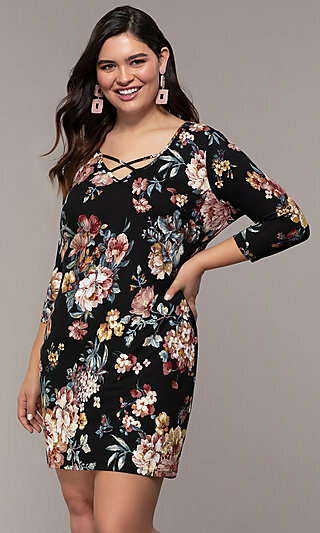 From the flowy and flirty style of a short floral-print cold-shoulder plus-size chiffon shift dress to the romantic vibe of a short a-line lace cocktail dress with a keyhole cut out, your inner fashionista will love the variety of styles of As U Wish dresses available at Simply Dresses. Where Can I Wear My As U Wish Dress? Shop this collection of chic semi-formal party dresses to find trend-setting styles that are ideal for a variety of events. You will find short ivory and pastel graduation dresses, beautiful floral-print dresses for casual events and summer outings, as well as short dresses for prom and homecoming. There are stunning high-low dresses and comfortable long maxi dresses perfect for showcasing your contemporary style at a family celebration or on vacation. To truly illustrate your individual style, try one of the fun two-piece dresses or form-fitting cocktail party dresses. There are two-piece prom dresses with shimmering sheer-lace bodices and cocktail party dresses that showcase your curves for an alluring vibe. From subtle accents and designs to elaborate styles, this assortment of designer dresses offers an affordable look for any event. Whether you’re attending a formal event or simply looking to expand your wardrobe, you’ll shine bright in a trendy As U Wish dress from Simply Dresses. Still not sure what to wear to your special event? A little black dress is a classic and timeless look that is always in style. There are several little black dresses in this collection of As U Wish dresses for under $100. From junior dresses for homecoming and prom to misses dresses for cocktail hour, there is an impressive variety of As U Wish dress styles to choose from. You will find sleeveless high-neck party dresses for date nights, casual shift dresses for graduations, and plus-size dresses in gorgeous prints for any semi-formal event on your calendar. Explore these short designer party dresses to find the ideal look to make you next special event a night to remember.